Wrigley's debuted their new jingles at the Nokia Theater in NYC on July 29, 2008. The 3 recording artists involved in each of their own jingles are Chris Brown, Ne-Yo, and Julianne Hough. If you are wondering what any of the jingles sound like, I hear that Chris Brown's song "Forever" is an extension of the jingle, so I am assuming the sound of the jingle will be a bit similar. Check out the pictures below and notice Chris in the Billionaire Boys Club hat and Ice Cream t-shirt. I told you guys if you want to dress like stars or have a swagger like one, then you have to stick with me. I can get you there, on any budget, + my fees, TOODLES! 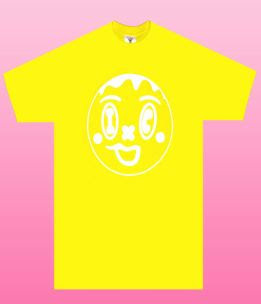 The Ice Cream smiley face tee is SOLD OUT!! But click this link to look at more Ice Cream apparel options. Julianne Hough and Dawn Richards from Danity Kane. Dawn is probably thinking, awww Julianne I wore a similar version of that dress months ago........we must be sisters. Julianne's version of this Alice + Olivia dress can be seen here. And was available at shopbop.com. Don't sleep on the importance of a street team! Is anyone else in this picture besides Jay-Z? 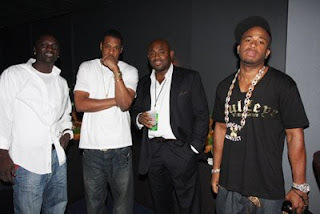 Oh yeah, Akon, Steve Stoute and Red Cafe'. 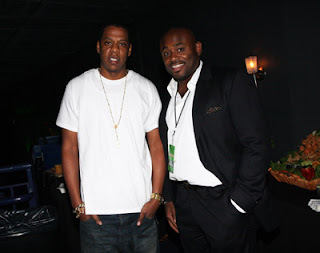 Another one of Jigga man, and Steve Stoute.